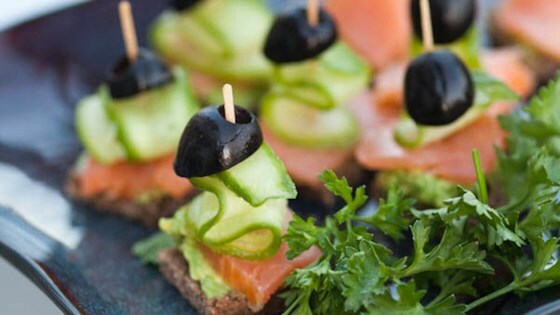 "These easy-to-make canapes are the perfect finger food for a cocktail party, New Year's, or during the Christmas festivities. They look very elegant and are simply delicious." Cut smoked salmon into squares the size of the pumpernickel bread. Mash avocado and lemon juice together with a fork in a small bowl. Spread a thin layer of mashed avocado on each pumpernickel piece, cover with a piece of smoked salmon, and sprinkle with dill. Secure cucumber slices onto bread squares with toothpicks and stick half an olive on top.